Tesla is selling $2 billion of its stock to finance the increased production capacity needed to meet the demand for its new Model 3 car. The Model 3 is expected to hit roads by the end of 2017. With a starting price of $35,000, it will be Tesla's first mid-priced vehicle. Tesla's other two vehicles, the Model S and Model X, cost at least $70,000. 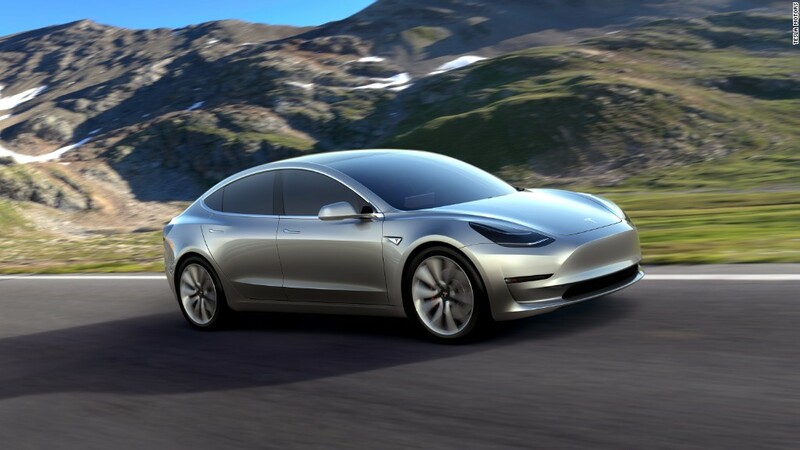 About 325,000 customers placed orders for the Model 3 in just one week and, as of May 15, it has received a total of 375,000 orders. Because of the strong demand, the company is raising money to accelerate production, it said Wednesday in a regulatory filing. Tesla (TSLA) said earlier this month it planned to invest more than $2 billion on production capacity this year -- $750 million more than initially planned. Expanding production is such a priority for the car company that CEO Elon Musk said recently that he sometimes sleeps on the factory floor in a sleeping bag he keeps in his office. Tesla plans to ramp up production to 500,000 vehicles annually by 2020 -- two years earlier than previously expected. It made about 50,000 cars in 2015. Shares rose 3% during the trading day Wednesday, when Goldman Sachs released a research report that upgraded the stock. The bank is named as one of the underwriters of the offering, along with Morgan Stanley, Deutsche Bank, and Citigroup.